The standard push-up is a classic exercise that truly challenges your entire body. When you master the move, you don't have to abandon push-ups for more complex exercises, however. Supercharge the push-up with different hand positions, unstable surfaces or varying angles. You'll still get the total body benefits of push-ups, but challenge your muscles differently, so you continue to see gains. A decline push-up puts emphasis on the fronts of the shoulders and upper portion of the chest muscle. Place your feet on an elevated surface, such as a step riser or workout bench, and your hands on the floor just slightly wider than your shoulders to press up and down. An incline push-up focuses on the muscles of the lower and middle chest. Place your hands shoulder-distance apart on an elevated surface and your feet on the floor for the push-up. The higher the surface, the less intense the incline push-up. Get into a push-up position with both hands placed on the ball and legs extended behind you. Bend your elbows to lower your chest toward the ball for a push-up. As you rise, lift your left hand and place it on the floor, leaving your right hand on the ball, to perform a push-up. Return to center and repeat with the right hand to the floor. Your triceps are particularly challenged by the push-up in which both hands are on the ball and your core activates to keep you balanced as you alternate hands. Do a push-up but with your hands on a stability ball to increase how much your core must activate to keep you from falling. Your hands rest on the ball, under your shoulders with the elbows in the direction of the ankles. Squeeze the ball with your hands and arms. Extend your feet directly behind you. Use the BOSU, which looks like half of a stability ball with a flat platform, for push-ups. Place your hands on the softer domed side with your legs extended behind you to perform a push-up, or flip the dome over so the soft side faces the floor and your hands rest on the solid platform. Both versions introduce instability and require increased involvement of your stabilizers in the abs and back. Put your hands and feet in a standard push-up position. Bend your elbows to lower your chest toward the floor and as you lift, raise your right arm and rotate your torso to the right; repeat on the left. 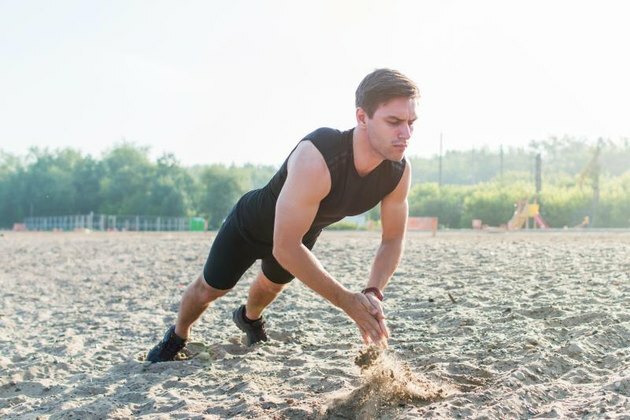 Do a standard push-up, but as you press up from the floor, do so explosively so the hands leave the ground and clap together before you return to a bent-elbow lowered position. Assume a standard push-up position, but bring your hands close together under your chest so that the fingers form a diamond pattern. As you lower down, allow the elbows to brush your ribs so that your triceps at the back of the upper arms experience greater activation. Start in a standard push-up position with your hands just wider than your shoulders. Walk your right hand an inch or two forward and the left hand an inch or two back. Complete the desired set of push-ups, and then do a set with the left hand forward and the right hand back. Get into a standard push-up position. As you bend the elbows out to lower your chest toward the floor, lift the right leg and bring the knee to your right tricep. Rise and return the foot to the floor; repeat with the left leg. Regardless of the push-up variation you perform, keep your form on point. Always brace your abdominals toward your spine as if you were trying to bring your bellybutton to your spine. The hips and back should stay in a straight line, rather than hike up or sag down. What Is an Uneven Push-Up?